How does the Motivating Factors of European Exploration of the Americas Lesson Plan differentiate instruction? Social Studies differentiated instruction is creatively displayed in the Motivating Factors of European Exploration of the Americas lesson plan. It uses both the Multiple Intelligence Theory and ability levels to differentiate instruction. To differentiate instruction for vocabulary, there are three vocabulary ability level worksheets. They all give the option to either use the linguistic Multiple Intelligence or the Spatial Multiple Intelligence in the right hand column. The enriched version of the vocabulary sheet allows students to write the definitions using their own words. The average leveled sheet allows students to fill in the blanks of the definitions. The basic leveled sheet allows the students to take the time they need to read the definition and then fill in the right had column just like the other levels. The Motivating Factors of European Exploration of the Americas lesson plan continues to differentiate instruction by providing two levels of note taking sheets for students. The enriched version allows for more critical thinking by allowing them to choose what they include in their notes and how they state it while following the PowerPoint. The basic note sheet is more guided and allows them to fill in the blanks as they go through the PowerPoint. The reason for this is to allow the students to listen to the content and then while the other students are writing in their notes, these students, who need to have repetition, can use partner review or ask questions for clarification. The pictures and links in the PowerPoint also bring in the Spatial Multiple Intelligence. The activity section of the Motivating Factors of European Exploration of the Americas lesson plan offers two options for students to choose from which should increase their interest. The first option is a political cartoon with focuses on the logical and spatial Multiple Intelligences. The second option is a persuasive speech which focuses on the linguistic and logical Multiple Intelligences. The students also have an option of working with either a partner or by themselves which brings in the interpersonal or intrapersonal Multiple Intelligence. There is an activity choice sheet that should be filled out by the students the day before the activity is to be started. This helps the teacher know how many copies of each activity will be needed and allows enough time to group appropriately. Each of these activities comes with a rubric too! There is a paragraph writing activity for homework and it comes with a grading checklist. For more information on the Motivating Factors of European Exploration of the Americas Lesson Plan follow the links below. Where can I get the Motivating Factors of European Exploration of the Americas lesson plan? What content is used in the Motivating Factors of European Exploration of the Americas lesson plan? http://www.teacherspayteachers.com/Store/Kasha-Mastrodomenico offers social studies differentiated instruction for middle school. Check it out! This entry was posted in Differentiated Instruction Lesson Plans, Exploration, New York State Social Studies, Social Studies Differentiated Instruction, Social Studies Differentiated Instruction Lesson Plans and tagged differentiate instruction, differentiated instruction, Motivating Factors of European Exploration of the Americas, Motivating Factors of European Exploration of the Americas differentiated instruction lesson plan, Motivating Factors of European Exploration of the Americas lesson plan, multiple intelligence, multiple intelligence theory, social studies differentiated instruction on October 18, 2012 by Kasha Mastrodomenico. How does the Iroquois Confederacy Lesson differentiate instruction? Social Studies differentiated instruction is done beautifully in the Iroquois Confederacy lesson plan. It uses both the Multiple Intelligence Theory and ability levels to differentiate instruction. 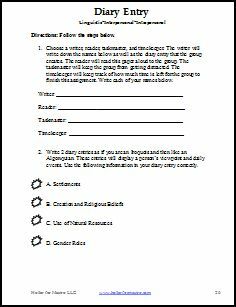 The Iroquois Confederacy lesson plan continues to differentiate instruction by providing two levels of note taking sheets for students. The enriched version allows for more critical thinking by allowing them to choose what they include in their notes and how they state it while following the PowerPoint. The basic note sheet is more guided and allows them to fill in the blanks as they go through the PowerPoint. The reason for this is to allow the students to listen to the content and then while the other students are writing in their notes, these students, who need to have repetition, can use partner review or ask questions for clarification. There are also maps and charts in both versions to bring in the Spatial Multiple Intelligence. The activity section of the Iroquois Confederacy lesson plan uses mixed ability level grouping. The students go through a mock run of the Iroquois Confederacy and it’s decision making process. The question for the students is whether or not the Tuscarora should be allowed to join the Iroquois Confederacy. The direction sheet is very easy for students to follow. For more information on the Iroquois Confederacy Lesson Plan follow the links below. Where can I find the Iroquois Confederacy Lesson Plan? What content is in the Iroquois Confederacy Lesson Plan? http://www.teacherspayteachers.com/Store/Kasha-Mastrodomenico offers social studies differentiated instruction for middle school! Check it out! This entry was posted in Native American Differentiated Instruction Lesson Plans, New York State Social Studies, Social Studies Differentiated Instruction, Social Studies Differentiated Instruction Lesson Plans and tagged differentiate instruction, Iroquois Confederacy, Iroquois Confederacy differentiated instruction, Iroquois Confederacy differentiated instruction lesson, Iroquois Confederacy differentiated instruction lesson plan, Iroquois Confederacy Lesson, Iroquois Confederacy Lesson Plan, multiple intelligence, multiple intelligence theory, social studies differentiated instruction on October 18, 2012 by Kasha Mastrodomenico. How does the Iroquois and Algonquian Cultures Lesson Plan Differentiate Instruction? 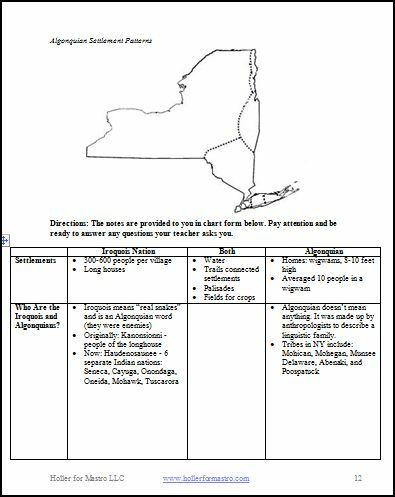 Social Studies differentiated instruction is done beautifully in the Iroquois and Algonquian Cultures lesson plan. It uses both the Multiple Intelligence Theory and ability levels to differentiate instruction. To differentiate instruction for vocabulary, there are three vocabulary ability level worksheets. They all give the option to either use the linguistic Multiple Intelligence or the Spatial Multiple Intelligence in the right hand column. The enriched version of the vocabulary sheet allows students to write the definitions using their own words. The average leveled sheet allows students to fill in the blanks of the definitions. 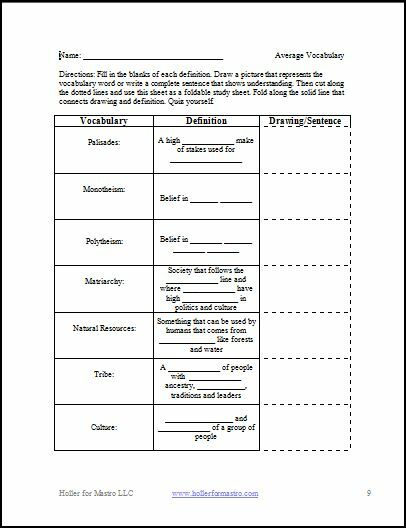 The basic leveled sheet allows the students to take the time they need to read the definition and then fill in the right had column just like the other levels. Below is the average level vocabulary sheet. 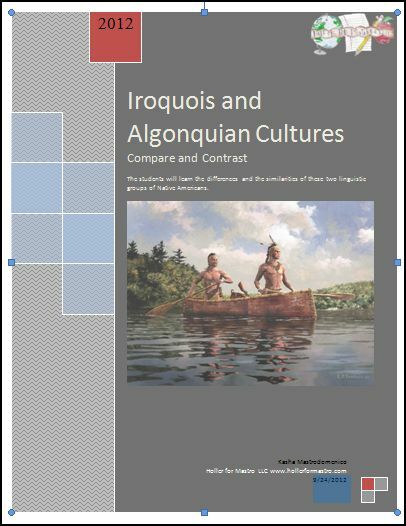 The Iroquois and Algonquian lesson plan continues to differentiate instruction by providing three levels of note taking sheets for students. The enriched version allows for more critical thinking by allowing them to choose what they include in their notes and how they state it while following the PowerPoint. The average note sheet is more guided and allows them to fill in the blanks as they go through the PowerPoint. The basic version sheet follows the PowerPoint mini-lesson and is almost all intact. The reason for this is to allow the students to listen to the content and then while the other students are writing in their notes, these students, who need to have repetition, can use partner review or ask questions for clarification. There are also maps and charts in both versions to bring in the Spatial Multiple Intelligence. Even the activity section of the Iroquois and Algonquian lesson plan uses differentiated instruction. There are two options for students to use the same content. The first option is writing a diary entry. Writing a diary entry brings in the linguistic and interpersonal or intrapersonal (depending on if they choose to have a partner or not) Multiple Intelligence. The second option is a drawing. The drawing brings in the spatial and interpersonal or intrapersonal Multiple Intelligence. Both of these activities even come with grading rubrics. 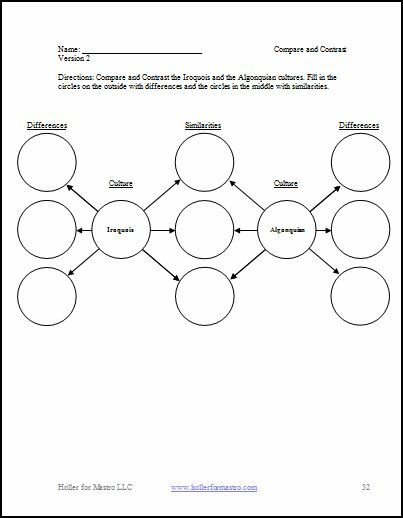 For the concluding set, two ability level versions of a graphic organizer are available. The basic version takes away the labeling step. For more information on the Iroquois and Algonquian Culture Lesson Plan follow the links below. Where can I find the Iroquois and Algonquian Culture Lesson Plan? What content is in the Iroquois and Algonquian Culture Lesson Plan? This entry was posted in Differentiated Instruction, Multiple Intelligences, Native American Differentiated Instruction Lesson Plans, New York State Social Studies, Social Studies Differentiated Instruction, Social Studies Differentiated Instruction Lesson Plans and tagged differentiate instruction, differentiated instruction, Iroquois and Algonquian Culture Differentiated Instruction Lesson Plan, Iroquois and Algonquian Cultures Lesson Plan, Iroquois and Algonquian lesson plan, multiple intelligence, multiple intelligence theory, social studies differentiated instruction on October 11, 2012 by Kasha Mastrodomenico. Where to find websites for social studies differentiated instruction? Social Studies Differentiated Instruction can be complicated to do for teachers since our planning time is so limited. It is our job to reach and challenge every student in our classrooms. The following link can help you learn what social studies differentiated instruction is as well as how to do it quickly. This entry was posted in Differentiated Instruction, Planning Differentiated Instruction, Social Studies Differentiated Instruction and tagged differentiate instruction, differentiated instruction, differentiated instruction multiple intelligence theory, differentiated instruction social studies lesson plans, multiple intelligence theory, social studies, social studies differentiated instruction, social studies differentiated instruction resources, social studies lesson plans on March 20, 2012 by Kasha Mastrodomenico. How can socioeconomics affect the development of multiple intelligences? It is believed that multiple intelligences can develop given the opportunity. If a family has enough money to buy a musical instrument and pay for lessons, it would be expected that their children would have a better chance to develop the musical multiple intelligence than those whose families can’t afford it. You can also think about the affects of socioeconomics on the kinesthetic multiple intelligence. People whose families can afford the best coaching have a better chance to have the kinesthetic multiple intelligence be a dominant multiple intelligence. Just because the wealthy have more resources available to them doesn’t mean people who grow up without money can’t develop these multiple intelligences. Families can push their young in developing certain multiple intelligences in ways that might not need monetary backing. Mentors, community and school coaches, teachers and church officials can also provide guidance in the development of multiple intelligences. For example, if a person whose family doesn’t have a high income and who had the desire to increase their musical multiple intelligence, they could join the church choir. A higher socioeconomic status can help people develop their multiple intelligences but it is not a necessity to have money to develop multiple intelligences. http://www.teacherspayteachers.com/Store/Kasha-Mastrodomenico/Category/Activity-Templates-and-Rubrics offers many classroom activities that can improve multiple intelligences and they come with rubrics for ease of grading. This entry was posted in Multiple Intelligences and tagged multiple intelligence, multiple intelligence theory, multiple intelligences on March 14, 2011 by Kasha Mastrodomenico. How can people develop multiple intelligences? According to Thomas Armstrong’s book “Multiple Intelligences in the Classroom,” anyone can develop any multiple intelligence over time if the right conditions exist. He believes that the ability to develop these multiple intelligences depends on biological endowment, personal life history as well as cultural and historical background. In other words, if someone has a brain injury or a genetic or inherited deficiency a certain multiple intelligence may not be able to develop to a competent level. For example, my mother in law was in several car accidents and is now partially brain damaged. Her linguistic multiple intelligence is barely competent. It’s like playing a guessing game when conversing with her. Due to her injury her ability to gain the linguistic multiple intelligence is limited. If someone grew up in an environment where certain multiple intelligences were unappreciated, they may not develop, as was the case with my spatial multiple intelligence. When I was in the seventh grade. I was in an advanced art class and even placed in an art contest but the next year my father refused to let me pursue art as an electiveand forced me to take keyboard typing. From that point on my once dominant spatial multiple intelligence decreased to be one of my weakest. Cultural and historical backgrounds can also influence the nourishment of multiple intelligences. Take the Soviet controlled part of Berlin during the Cold War. Young people that felt “self-worth” or individuality were considered suspect and were sometimes even sent to boarding schools or reeducation centers. Due to this, the intrapersonal multiple intelligence at this place and time in history were not valued and were not often developed to competent levels. If the right conditions are present, most people will be able to nourish their multiple intelligences. Multiple intelligences can develop as long as there is a need or an interest in the multiple intelligence. The more someone practices using the specific multiple intelligencethe more competent they will become when using the multiple intelligence. http://www.teacherspayteachers.com/Store/Kasha-Mastrodomenico/Category/Activity-Templates-and-Rubrics offers many classroom activities with rubrics that are based on the Multiple Intelligence Theory. They can easily and quickly be used to differentiate instruction. This entry was posted in Multiple Intelligences and tagged differentiate instruction, differentiate instruction multiple intelligences, differentiated instruction, multiple intelligence, multiple intelligence theory, multiple intelligences on March 13, 2011 by Kasha Mastrodomenico.